Bling’s Cycles in New Jersey recently built this 1941 Harley Davidson. It was built by and for the owner of Bling’s, Bill Dodge. Bill is no newcomer to the scene, building bikes since he was sixteen and working for a reputable shop in Long Beach for 8 years. Bill builds bikes that are clean, fast, functional and simple like this bike aptly named the Nickle Knuckle after its 74 Cubic inch KnuckleHead engine. The bike is like a cross between a bobber and a dirt tracker, looking at the specs we can see why. The front end is Harley Davidson Narrow Glide, the gas tank is from an old Indian dirt bike, oil tank from a 1949 Ford Aftermarket, the rear knobby tire is a Metzler 150/70/18 and the front is a Bridgestone 23/3.00 and the beautiful paint job was done by the guys at French Kiss Kustoms. The ultra clean looking chassis is custom made by Bill and he calls it the Bling’s Cycles Choppa Killa. 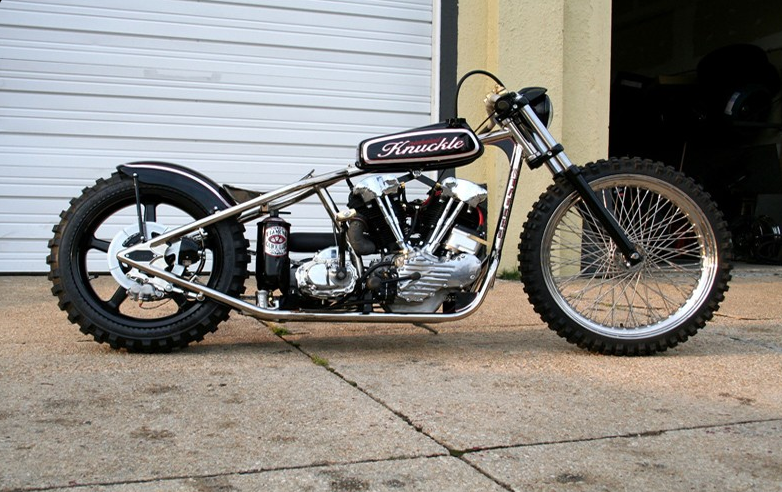 To see more pics of this killer bike check out the Nickle Knuckle gallery.